Create a new working directory on your remote computer. This is a tutorial for a workshop on long-read (PacBio) genome assembly. It demonstrates how to use long PacBio sequencing reads to assemble a bacterial genome, and includes additional steps for circularising, trimming, finding plasmids, and correcting the assembly with short-read Illumina data. Your workshop trainers will provide you with the address of a virtual machine. Type in the password provided. If you are using Windows 10, you might be able to use the Ubuntu Subsystem. Otherwise, install and open Putty. Open. A configuration window will appear. Under "Host Name (or IP address)" enter in the address of your virtual machine. Under "Connection Type" select "SSH"
Under "Login as:" enter "researcher"
(This points us to some different directories for the software we need). Because we are starting a new analysis it is always good practice to start in a new empty directory. Therefore, we will create a new directory and change to it for the rest of the workshop. Create a new directory called "Workshop"
NOTE: Every time you open a new terminal or Putty session, you will need to make sure you are in this directory again. The sample used in this tutorial is from a bacteria called Staphylococcus aureus. We have used a small section of its real genome so that the programs can run in the workshop time. In a new tab, go to https://doi.org/10.5281/zenodo.1009308. Next to the first file, right-click (or control-click) the "Download" button, and select "Copy link address". Note: paste the link to the file, not to the webpage. Repeat this for the other two files. Type in ls to check the files are present and correctly-named. We should have R1.fq, R2.fq and pacbio.fq. We will use the assembly software called Canu, version 1.7.
genomeSize only has to be approximate. (In this case we are using a partial genome of expected size 30,000 base pairs). corThreads=3 sets the number of available threads. Canu will correct, trim and assemble the reads. Various output will be displayed on the screen. Note: Canu could say "Finished" but may still be running. In this case, type squeue to see if jobs are still running. You will know if Canu has completely finished when squeue shows no jobs listed under the header row. The canu.contigs.fasta are the assembled sequences. The canu.unassembled.fasta are the reads that could not be assembled. The canu.correctedReads.fasta.gz are the corrected Pacbio reads that were used in the assembly. The canu.contigs.gfa is the graph of the assembly. The canu.report file is a summary of all of the steps Canu performed with information about the reads used, how they were handled and a whole lot of summary information about the assembly. "47997" is the number of base pairs in that contig. This matches what we were expecting for this sample (approximately 30,000 base pairs). For other data, Canu may not be able to join all the reads into one contig, so there may be several contigs in the output. "less" is a command to display the file on the screen. Use the up and down arrows to scroll up and down. You will see lots of histograms of read lengths before and after processing, final contig construction, etc. Type q to exit viewing the report. How do long- and short-read assembly methods differ? Answer (click to reveal) Short reads are usually assembled with De Bruijn graphs. For long reads, there is a move back towards simpler overlap-layout-consensus methods. Where can we find out the what the approximate genome size should be for the species being assembled? Answer (click to reveal) Go to NCBI Genomes, enter species name, click on Genome Assembly and Annotation report, sort table by clicking on the column header Size (Mb), look at range of sizes in this column. In the assembly output, what are the unassembled reads? Answer (click to reveal) Reads and low-coverage contigs that were not used in the assembly. What are the corrected reads? How did canu correct the reads? Answer (click to reveal) Canu builds overlaps between reads. The consensus is used to correct the reads. Where could you view the output .gfa and what would it show? Answer (click to reveal) A useful program is Bandage. If the assembly has multiple contigs, the assembly graph shows how these are connected. Because of sequencing errors, there may be some "overhang" in the assembled linear sequence. Our assembly may have some overhang because it is 9000 bases longer than expected. A tool called Circlator identifies and trims overhangs (on chromosomes and plasmids). It takes in the assembled contigs from Canu, as well as the corrected reads prepared by Canu. circlator_outdir is the name of the output directory. Some output will print to screen. When finished, it should say "Circularized x of x contig(s)". Circlator has named the output files with numbers as prefixes. 04.merge.circularise.log is the name of the file. Yes, the contig was circularised (last column). What are the trimmed contig sizes? The contig "tig00000001" has a length of 30019. This is about 18,000 bases shorter than before circularisation. This was the "overhang" and has now been trimmed. Were all the contigs circularised? Answer (click to reveal) In this example, yes, the contig was circularised. Circlator can set the start of the sequence at a particular gene. Which gene does it use? Is this appropriate for all contigs? Answer (click to reveal) Circlator uses dnaA (if present) for the chromosomal contig. For other contigs, it uses a centrally-located gene. However, ideally, plasmids would be oriented on a gene such as repA. It is possible to provide a file to Circlator to do this. Pacbio reads are long, and may have been longer than small plasmids. We will look for any small plasmids using the Illumina reads. Use the Canu+Circlator output of a trimmed assembly contig. 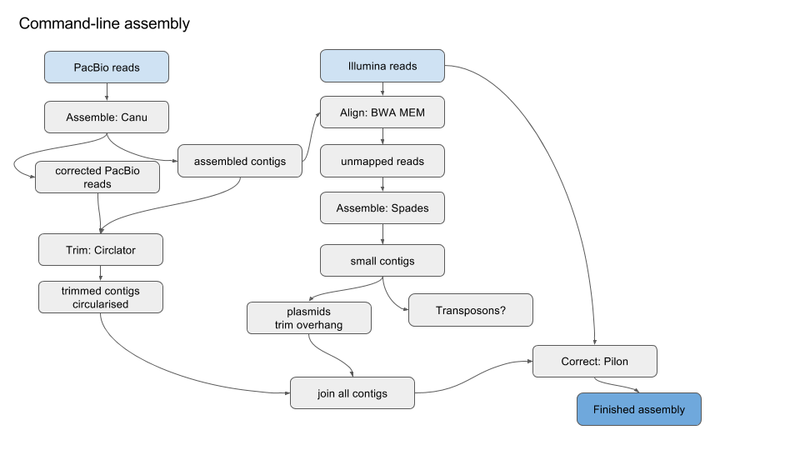 Map all the Illumina reads against this Pacbio-assembled contig. 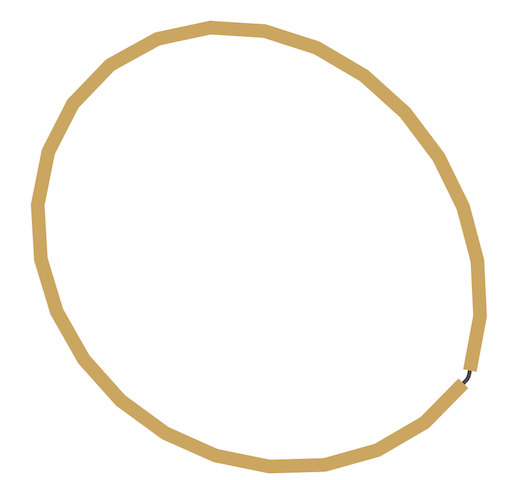 Extract any reads that didn't map and assemble them together: this could be a plasmid, or part of a plasmid. Look for overhang: if found, trim. We now have three files of the unampped reads: unmapped.R1.fastq, unmapped.R2.fastq, unmapped.RS.fastq. 1 contig has been assembled with a length of 2359 bases. To trim any overhang on this plasmid, we will blast the start of contig2 against itself. We want to see if the start of the contig matches the end (overhang). -db sets the database as that of the original sequence contig2.fasta. We don't have to specify the other files that were created when we formatted this file, but they need to present in our current directory. The first hit is at the start, as expected. We can see that "Query 1" (the start of the contig) is aligned to "Sbject 1" (the whole contig), for the first 540 bases. Scroll down with the down arrow. The second hit shows "Query 1" (the start of the contig) also matches to "Sbject 1" (the whole contig) at position 2253, all the way to the end, position 2359. Therefore, in the next step, we need to trim the contig to position 2252.
nano opens up a text editor. At the first line, delete the text, which will be something like ">NODE_1_length_2359_cov_3.320333"
We now have a trimmed plasmid. Why is this section so complicated? Why can PacBio sequencing miss small plasmids? Answer (click to reveal) Library prep size selection. We extract unmapped Illumina reads and assemble these to find small plasmids. What could they be missing? Answer (click to reveal) Repeats that have mapped to the PacBio assembly. How do you find a plasmid in a Bandage graph? Answer (click to reveal) It is probably circular, matches the size of a known plasmid, and has a rep gene. Are there easier ways to find plasmids? 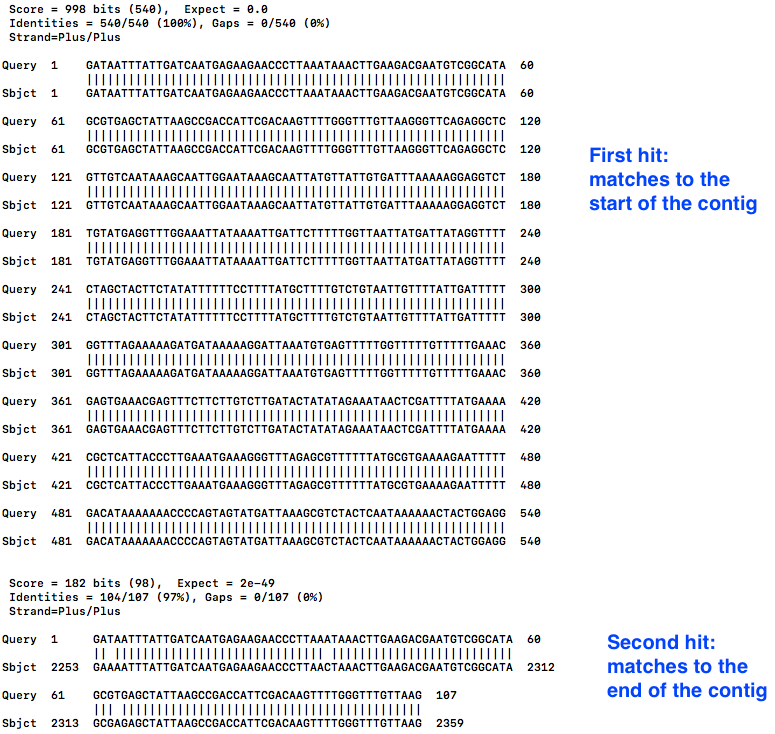 Sequences from PacBio can have more errors than those from Illumina. Therefore, although it is useful to use the long PacBio reads to assemble the genome, we can also use the shorter and more accurate Illumina reads to correct errors in the PacBio assembly. Aligns Illumina R1.fq and R2.fq to the PacBio assembly genome.fasta. We can see lots of cases where a deletion (represented by a dot) has been corrected to a base. We now have the corrected genome assembly of Staphylococcus aureus in .fasta format, containing a chromosome and a small plasmid. Why don't we correct earlier in the assembly process? Answer (click to reveal) We need to circularise the contigs and trim overhangs first. Why can we use some reads (Illumina) to correct other reads (PacBio) ? Answer (click to reveal) Illumina reads have higher accuracy. Could we just use PacBio reads to assemble the genome? Answer (click to reveal) Yes, if accuracy adequate. In the workshop so far, we used a partial bacterial genome so that the exercises could run in the time available. As a demonstration, to better see the effect of long and short reads on the assembly, we will examine a complete bacterial genome. This bacterial genome has been assembled from either long PacBio reads (using Canu) or shorter Illumina reads (using Spades). Look at the assembly graph (usually has a suffix .gfa), in the program Bandage. 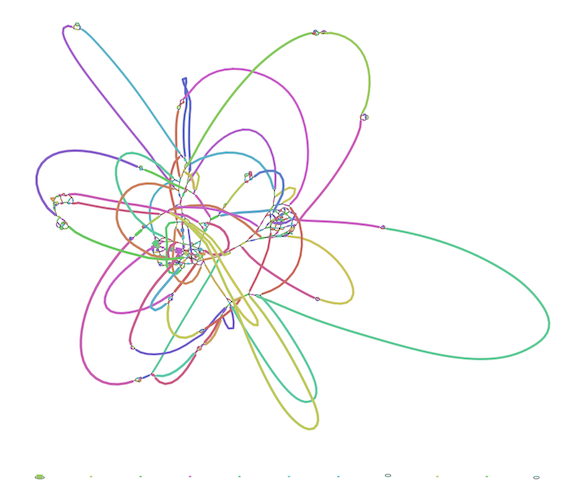 This shows how contigs are related, albeit with ambiguity in some places. Here we can see that the long read data results in a more contiguous assembly - one complete chromosome versus many smaller contigs with ambiguous placement. Does it matter that an assembly is in many contigs? Answer (click to reveal) Yes and No. Yes: broken genes can lead to missing/incorrect annotations; fragmented assemblies provide less information about the genomic structure (e.g. the number of plasmids) and the location of genes of interest (e.g. gene A is located on plasmid X). No: many or all genes may still be annotated correctly. Gene location is useful (e.g. chromosome, plasmid1) but not always essential (e.g. presence/absence of particular resistance genes may be enough information). Genomic features such as genes can be identified with annotation tools. We have used a tool called Prokka to annotate the two genomes described above. Why are there more CDS identified in the PacBio assembly? Answer (click to reveal) The PacBio assembly may have errors (usually a one base indel) which will cause a frame shift, which can result in three things: a longer CDS, a shorter CDS, or a shorter CDS plus an additional CDS. In addition, the Illumina assembly is about 33 kb smaller than the PacBio assembly. In bacteria, a rule of thumb is that 1 kb is roughly equal to one gene. Thus, we would probably expect about 33 fewer identified genes, which fits with these results. Why are there more rRNA identified in the PacBio assembly? Answer (click to reveal) There may be multiple copies of the rRNAs and these could have been collapsed as repeats in the Illumina assembly. In this workshop, we used bacterial sequencing data from long and short reads to produce a polished genome.